Bonjour lecteurs! After reading Living Arrows 43/52 yesterday, many of you asked me where Baba’s outfit was from. We answer maintenant in Baba Fashionista with MarMar. 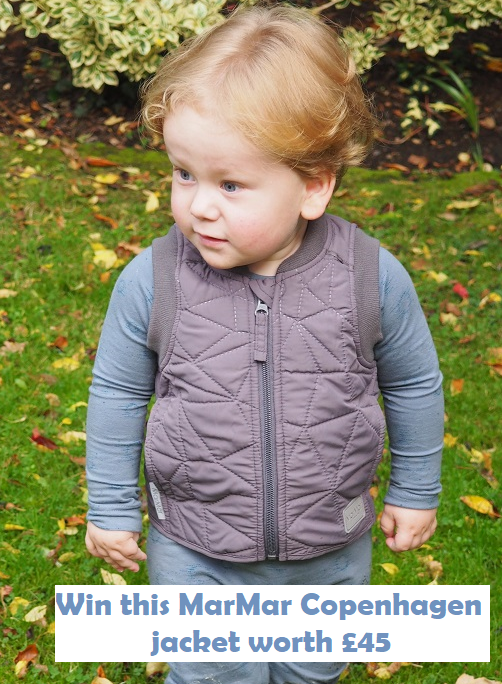 Not only we tell you about this cute ensemble that you have seen on our Instagram, but you can also win the same jacket that le Frenchie bébé has been wearing for a couple of weeks! This jacket is worth about £45 and it could be yours to be warm and trendy this Winter! Bienvenue to our new fashion post with Baba Fashionista with MarMar Copenhagen. The Danish brand was created by Marlene Anine Holmboe. The designer has a degree from The Royal Danish Academy of Fine Arts, Schools of Architecture, Design and Conservation. After receiving the certificate, she designed kids’ wear for numerous well-known Danish kids wear brands, and in 2007 she decided to take the plunge and create her own label. So what is MarMar Copenhagen‘s style? It’s a cool and stylish kids’ fashion. The brand uses beaucoup de contrasts: country-chic and urban coolness, old and new, luxurious and functional. It is these contradictions which make the clothes unique and enable you to use it in a variety of ways. You know well Baba by now, he loves standing out of the crowd, so this label is parfaite for us! Another thing we love? Most of its clothes are made of OEKO-TEX certified textiles and are being produced as close to Europe as possible, in order to minimize transportation and reduce the impact on the environment. There is nothing better than a sustainable brand! We strongly believe that while being trendy, it is also primordial to be conscientious. So far, MarMar Copenhagen has many assets we like. Let’s see the clothes we received for this review and what we think of them! I don’t know about you but I am a huge fan of bodysuits. Something I noticed in the UK, is that very often, they are not available past 24 months old. It is a shame as je pense they are key items for toddlers. 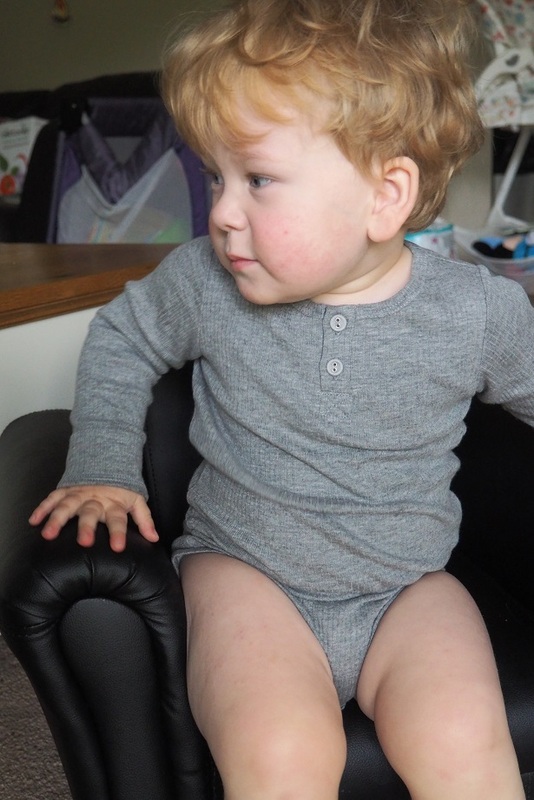 They make a great piece to use as an undergarment and keep our little ones warm. This one is a particularly nice piece. Made of 50% modal and 50% cotton, it is soft but also resistant. In size 3, it fits really well Baba and it is obvious that we will keep using it for a while. Posing for the camera… or busy doing something else!? The grey colour is also parfaite for the season and I like the buttons at the top. Used both as a top or as an underlayer, it has proven to be really useful while looking super chic. 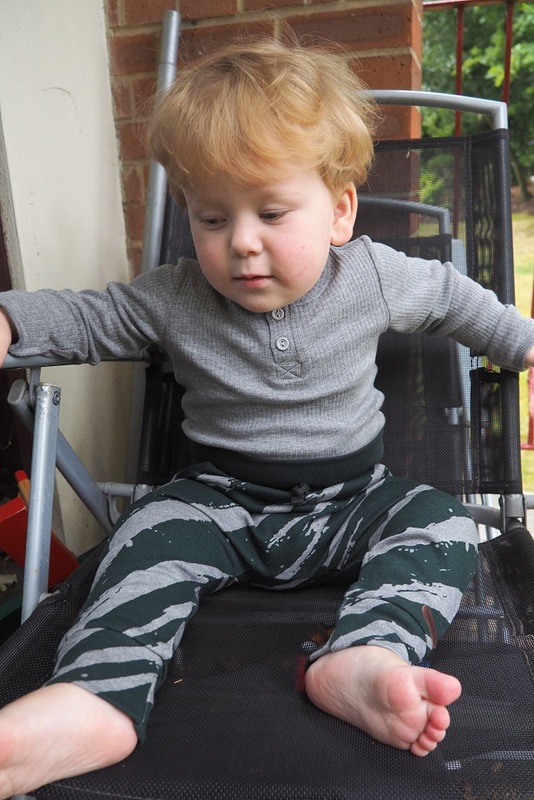 Baba wore it on its own while relaxing at home, but we also teamed it up with trousers for a more versatile use. The next item is actually going really well with it! Regardez! What is there not to like with this pantalon (trousers)? The print is simply fabulous. It looks chic but also urban. This piece is unique and I really like the waistband you can fold to make it trendy. Those pants are fab as they are easy to put on. Once more, the fabric (84% cotton) is very resistant. Je suis confiant(e) that Baba is comfy and warm while wearing them. You can keep washing this item again and again. The quality is so good, it looks as new as the first day. And look what we got to go with it! I am eating some chocolate! This baseball jacket with the same funky print is gorgeous! Baba wears is both as a jacket when it is a bit frisky but not too cold or as a sweatshirt for a total look! The cute detail I love? The button at the top that means my little boy’s neck is protected against the wind. This outfit is seriously cool, especially when worn with the matching pants. Plus this type of clothes is un rêve for any maman. It is comfy and warm. You are sure your little one can have many adventures in it. It’s easy to wash and dry. Who is the star of the park? Moi! A great item for the season! 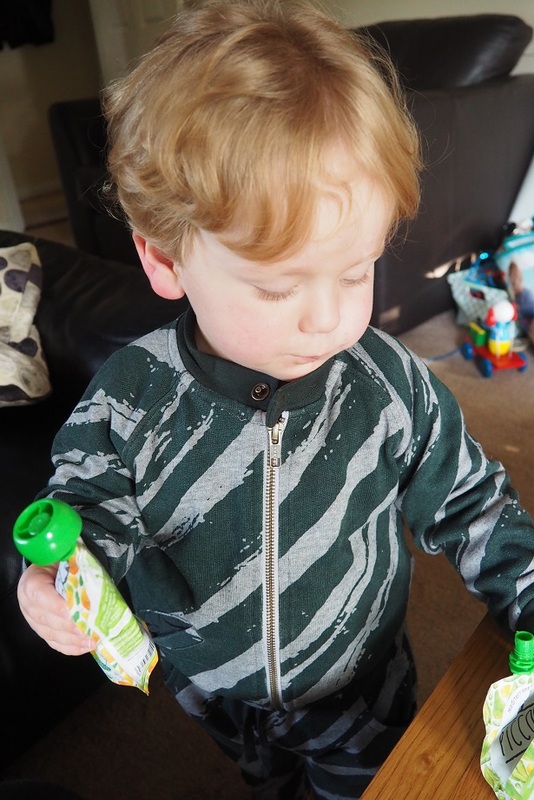 The colours go well together and it gives a cool edgy look to my toddler. Actually, he looks vraiment grown up in the full ensemble. So cool for the town but also if we decide to go for a walk in the woods! Bodysuits are not my only ‘key item’. 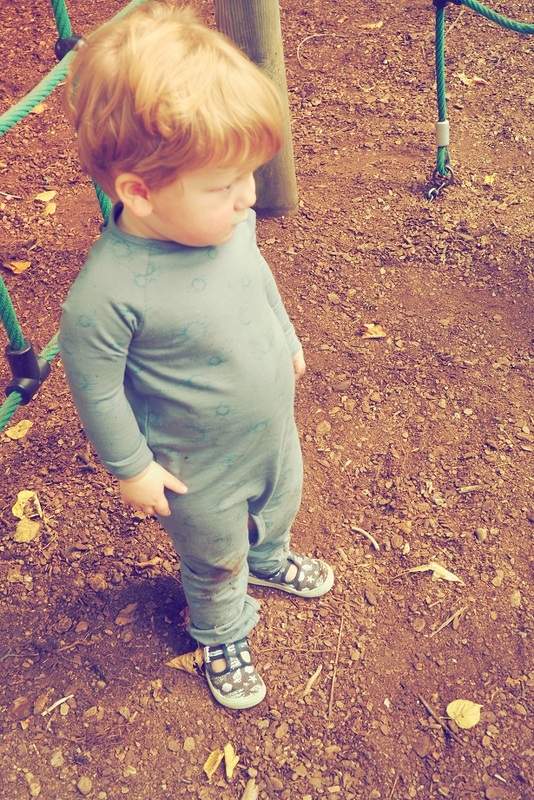 A good pair of rompers is always nice for a toddler. This one in a gorgeous stormy blue colour doesn’t fail to please. Never mind my tummy… I just had some lunch! The buttons along one shoulder and in the legs means it is so easy to take on and off. Facile to change le bébé if you are out and about. Plus in a size 2, it fits well le Baba. Another quality piece of clothing that we will keep all the season. The things I love the most about it? Its soft material but also its super sweet print. While the colour looks super boyish, the moons all over it give the outfit an adorable feel. 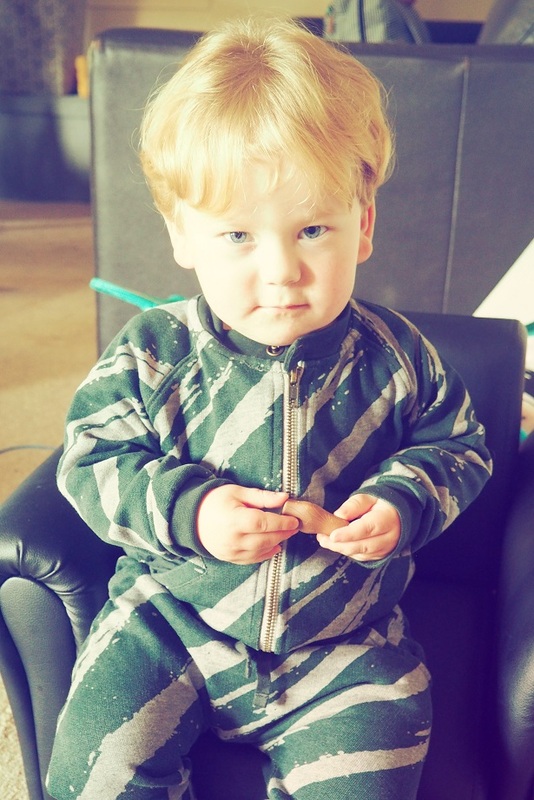 It’s like my Baba is still my baby (even if, let’s be honest, he is growing up into a gorgeous toddler!). It is soft but warm. 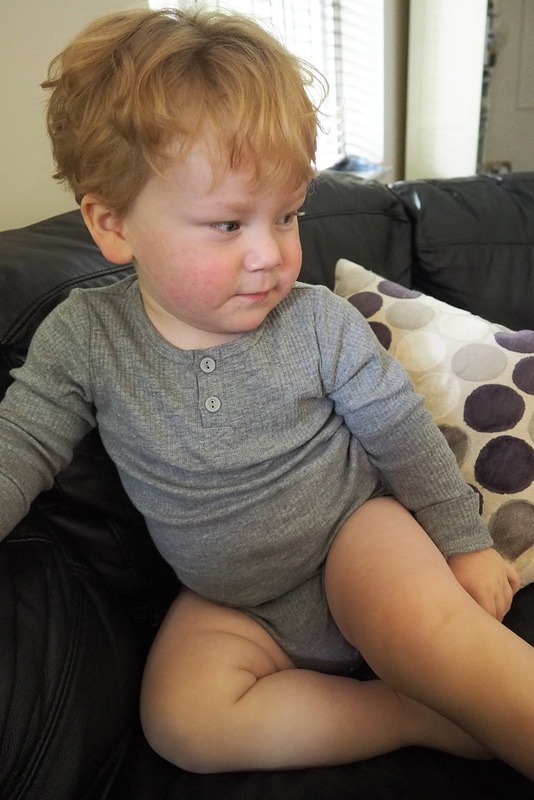 I might actually use it as a sleepsuit if we are running out of PJs! 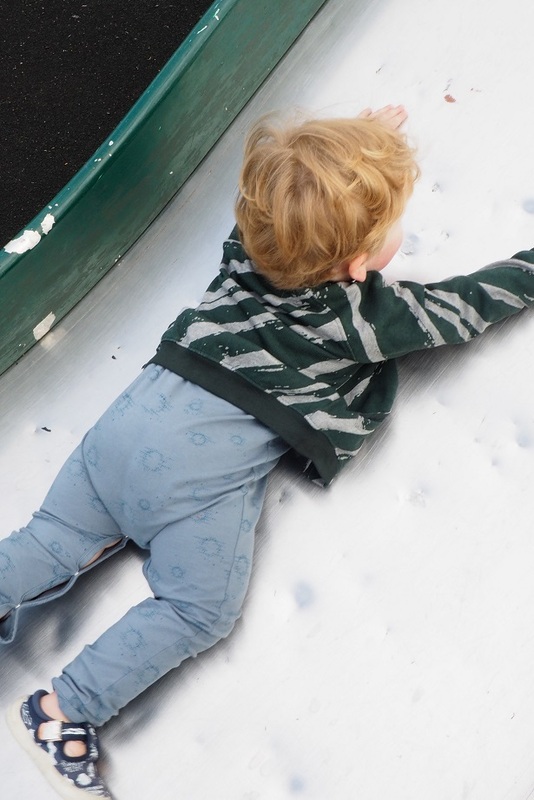 So comfy I can climb this slide! This jacket is described as grey. Cependant, it looks a bit brown in my opinion. Never mind how to describe the colour! This is the most beautiful Thermo Jacket I have ever seen! Seriously, it is so well made, I would like one for myself! The colour is luxurious and the finish is stunning. Facile to zip, I love the little details like the fluorescent bit at the back. Even the back of this jacket is super cool! It looks super urban, but yet it is so stylish! Made of 100% Polyester, the jacket is thin but yet keeps my Baba super warm! It has been our new key item to go to the park or for Sunday walks in the countryside! Another great feature? The jacket can be folded upwards with the help of small velcro details if you do not want it to be longer here. I love it when a piece of clothing is so versatile. It makes you feel like you have more choice in our wardrobe. Plus it’s great that a brand gives you the choice! Isn’t it gorgeous? Even better! You will be in to win the same for your little one at the end of the post! 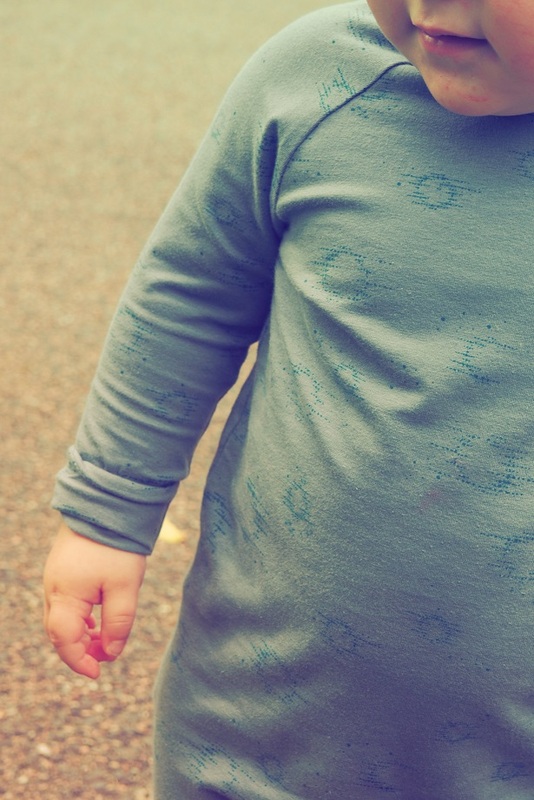 Hurrah for Baba Fashionista and our collaborations with great labels like MarMar Copenhagen! No doubt that MarMar Copenhagen makes beautiful clothes. We love all the items we received. Not only they give an urban chic look to Baba, but they are also very functional. All items are made of very good quality materials and they are perfect for the season. Marlene Anine Holmboe has for sure a great talent. She creates beautiful pieces with neutral colours. It’s subtle but yet different. We love the textures, the print and particularly the cute details put into each item. I am super trendy and I know it! If you want something chic that will last you for a while (you could pass it onto the next baby! ), then make sure to check out MarMar Copenhagen’s website. They also have some gorgeous pieces for girls and mamans! I really like its Leopard collection! Are you in love too? Do you like sustainable brands that are also chic and pure? 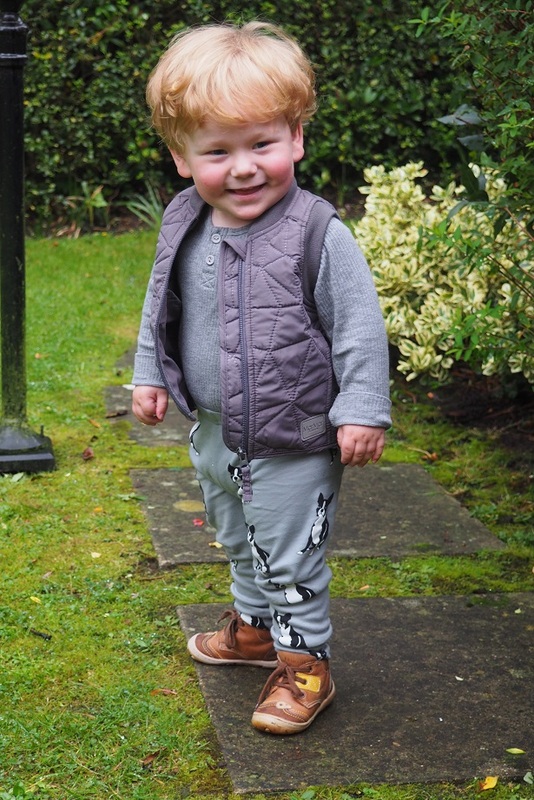 Then enter our giveaway now to win 1 OBY – WARM GREY jacket worth £45! It will become THE OUTFIT this season! Who would like to win this item? This giveaway starts on Sunday 22nd October at 5 pm and ends at midnight on the 22nd November. Provision of the prize is the responsibility of MarMar Copenhagen. Thanks for reading Baba Fashionista with MarMar Copenhagen and following our kids’ fashion series every week. We are so proud to present you with fabulous brands like this one! See you soon for more cute labels in town! I love the ROBERT – NATIVE MOON STORMY BLUE romper! 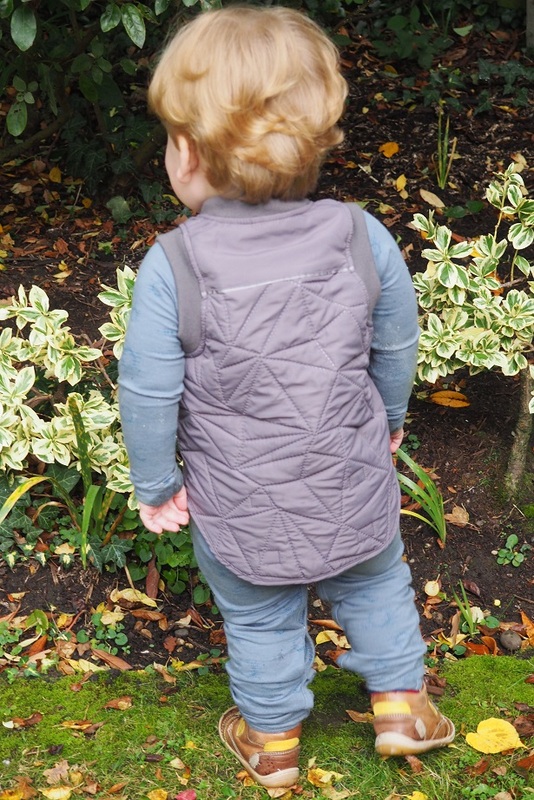 It is so sweet and looks so comfy to wear, especially great for active boys! I love the OSKAR – NAVY coat! For mummies I love the Dee Dee dress! I love the OSKAR navy coat. The Oskar navy coat is my favourite. the Rompy in rose for nieces little one! I like the ROBERT – NATIVE MOON STORMY BLUE the most. LEO RAMONA – BROWN LEO – very swish! I like Ode in Navy. The oskar navy coat is lovely. Love TOBIAS – FORREST SHADDOW PAINT PRINT!! i absolutely love the PLAIN ROMPY – BLACK/OFF WHITE its beauitiful!!! I love the TOBIAS – FORREST SHADDOW PAINT PRINT bomber jacket! Robert – Native Blue Story Blue! Really love the Oskar coat in Navy or black but can’t justify the $240.00 price tag, given the way coats are treated at school! Love the Oskar navy coat. I think the forest shadow leggings – look so stylish I’d like a pair! I really like the Oskar navy coat. 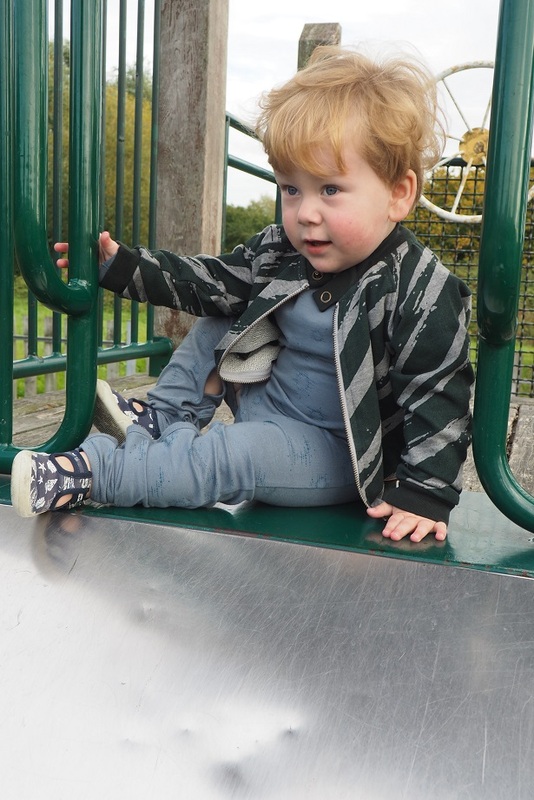 I love the OSKAR Navy Coat but they are all super! I love the grey bodysuit! I like the tobias-forrest-shaddow-paint-print jacket. I adore the OSKAR – NAVY coat, its gorgeous. I like the Oskar Navy coat. I love the Thermo Jacket!! its super cute. I love the LEO RAMONA – GREY LEO dress. 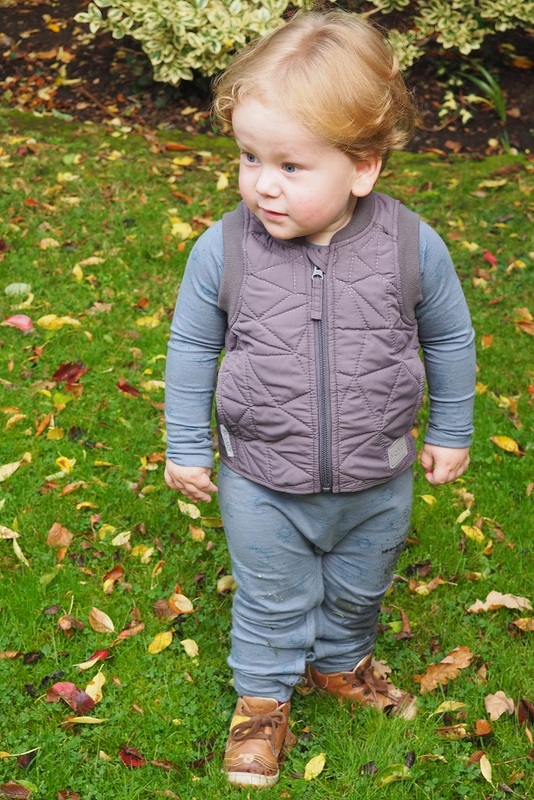 The OBY – WARM GREY jacket is great. the Plain Rompy in Grey Melange looks very comfy.